This series explores the applications and benefits of wood heat. It also helps you to decide if installation of a wood heat system is right for you! You will need to understand both the benefits and limitations of wood heat before you make the decision to install a system. You will be more satisfied with your decision to install wood heat if you know what to expect before installation. Is Heating with Wood Right for Me? The following list may help you decide if heating with wood will work for you. Have you considered the role that wood heat might play in your home? The type of heating unit, cost, and back-up heating fuel (propane, natural gas, electric, etc.) will vary according to how you intend to use wood. For example, if wood heat is the primary form of heat in your home you may purchase a larger unit and require a smaller back-up heating source than if you are looking to add wood as a part-time heat source or decorative addition to a room that will only be operated occasionally. These fact sheets will provide a general overview of wood heat, but you should be prepared to discuss your specific needs and objectives with a qualified installer. Have you researched your community restrictions, home heating sources, and demands? There are many options for heating your home, especially if you are building a new house. You will be able to make a more informed decision about wood heat if you understand what type of energy you are currently using to heat your home, how much energy you are using, how much money you are spending, and what energy efficiency measures you could take to reduce your heating demand. Use the information at the end of this fact sheet to better understand your home heating consumption. Renewable energy systems, such as wood heating units, are more cost effective in markets where prices for fossil fuels are high and alternative energy sources abundant. Do you have a good (legally accessible, abundant, suitable tree species, reasonable tree sizes, etc.) sustainable wood fuel resource available close by? Many factors determine the quality of a forest based-fuel resource. Transportation distance is a key consideration in the long-term economic viability of a wood heat system. the full cost as some incentives are tax credits or rebates received after installation. Do you have the physical ability and time available to use wood? Unless you are considering a wood pellet system, heating with firewood takes time, resources and some hard physical labor. Research suggests that it requires about 15 hours of work to produce a standard cord of firewood (a stack of wood measuring 4ft x 4ft x 8ft) from cutting the standing trees to stacking the sized pieces at the point of use. These hours do not include hauling/transportation. Stove-tending time is about 10 hours/cord, resulting in a total of about 25 hours required to produce and use a cord of firewood. The average home’s heat demand of 53 Million BTU/ year would require between 3 and 5 cords of wood, depending on the wood species used and stove efficiency. Does your area allow wood burning units? Some residential areas either do not allow solid wood burning devices or require special permits. Restrictions may limit emissions (thus the kind of fuel you are allowed to burn) or days you can burn (for example burning may be restricted on days when air quality is poor). 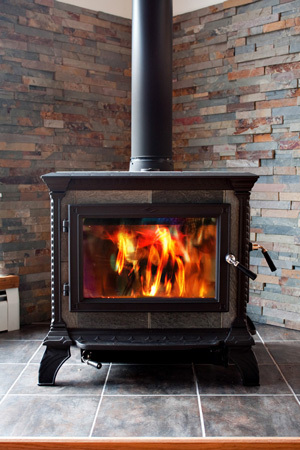 Some areas prohibit the installation of wood burning units that emit more than a certain amount of particulates; others allow only the most efficient wood pellet stoves. Research and understand the restrictions in your area to ensure you will have adequate opportunities to burn and that your system design will not violate emissions standards. Are you willing to maintain the system? Wood burning units require regular maintenance. Maintenance requirements are different for each system. You will need to bring in wood or pellets frequently, clean out ashes regularly, clean the flue/chimney and annually inspect and repair components of the stove and flue/chimney. Do not consider heating with wood if you are not willing to maintain your system or to hire someone to perform maintenance work on a regular basis. What other motivations do you have to heat with wood? People invest in renewable energy for a variety of reasons. For example, you may be motivated to be less dependent on fossil fuels and its suppliers. Perhaps you are working to reduce your personal carbon footprint. Are you simply trying to reduce your current energy costs? Are you trying to hedge against future energy costs by using wood as a back-up fuel to your current system? Your reasons for exploring wood heat will influence your decisions about system size, economic benefit, and system type. Take time to think about your reasons for this investment before talking to a qualified installer.